Industrial Diamond Association of India, Diamond Industry India, Indian Diamond Industry, Diamond Association of India. The Diamond Tool industry is still in its stage of infancy in India. Perhaps it is one of the most promising industries in the country's march on the road to progress. Till the early 1960's, there were no manufacturers of Diamond Tools in the country. Tools that were required had to be imported from other countries. In the mid 1960's, however, the picture began to change. Indigenous manufacture started in a small way. The acceptance of indigenous Diamond Tools continuously has been increased and in the mid 1980's the growth graph took a steep curve upward, coinciding with the booming growth of the Stone Industry. Today in this world of globalization there are nearly two hundred units manufacturing Diamond Tools scattered all over India, catering to all kinds of industry. The earliest use of the Diamond Tools was in the Engineering and Stone Industry and new avenues for use of Diamond Tools opened up in line with the technological development of Diamond Tools. To promote the use of Diamond Tools in various industries. To identify themselves with the economic and industrial growth of the country. manufacturers and users in the country. To provide a common platform for mostly fellow manufacturers to interact. through effective communication with Government and other Authorities. 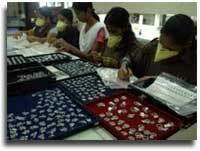 The name of society is "Industrial Diamonds Association of India". The office of the Society is situated at Mumbai in the state of Maharashtra. C/o Bombay Chamber of Commerce & Industry, Mackinanon Makanzie Building., Ballard Estate, Mumbai - 400 001. (a) To promote, encourage, advance and create a spirit of co-operation amongst all members, and impart information, instructions and skillfull knowledge to members in particular and to citizens in all parts of the world in general on all matters concerning the Industrial Diamond Association. (b) To provide a meeting place for imparting information, instructions and skillful knowledge, for exchange of view of all person and /or bodies concerned and/or interested in the aim and object of the Association. (c) To co-ordinate the activities of all individuals and/or bodies concerned and/or interested in the aim and object of society and for that purpose provide a channel or communication with similar or allied bodies, associations or societies in countries outside India. (d) To arrange suitable lectures and demonstration by various means with a view to impart skillful knowledge pertaining to industrial diamonds and industry thereof and to create a desire and interest in the development of the industrial diamond industry in India. (e) To start, establish, conduct, maintain and manage reading rooms, libraries, laboratories, publishing house and the like for the purpose of facilitating and spreading education pertaining to industrial diamonds for the benefit and use of the members of the Association. (f) To start, conduct and distribute publications of periodicals and magazines for the spread of knowledge and information regarding industrial diamond industry in India and in other countries. (g) To receive, even entertain and examine complaints and grievances of the members in particular and of the public in connection with the industrial diamond industry in India and to attend to and take up such complaints and grievances with the authorities or the government concerned. (h) To investigate into and solve problems peculiar to the industrial diamond industry with a view to develop the growth and progress of this industry in India. (i) To co-operate with the government and also to seek and obtain representation on bodies or committees which are formed to promote the industrial diamond industry in and outside India. (j) To protect, safeguard and further the interests of the industrial diamond industry and the industries connected therewith in India by representation, petitions and memorials and deputations to the Central or State Government or to any other government or to any public body or authority or to any official or non-official organization or minister or officer representing such Government or bodies. For the purpose of registration the number of members of the Association is declared to be unlimited. The Executive Committee may at any time create different classes of members and may provide for their entrance fees and annual membership subscription and define their rights and privileges. The Executive Committee shall further in special case, have the power to allow any person, firm, company or corporation to become a member of the Society for such purposes and subject to such conditions and upon payment of such sums as the Executive Committee may, in their absolute discretion, think fit. In such case the Executive Committee shall have the power to and may dispense with payment of entrance fee. Any individual, firm or even also the company having an established place of business in India and who deals with Industrial Diamonds either as a manufacturer, importer, exporter, owner or industrial diamond product manufacturer or agent of any or all of them, shall be eligible for membership as an Ordinary Member of the Society, provided an application is made and accepted by the Executive Committee. An Ordinary member having a branch in India and all others connected within the manufacturer, use and marketing of industrial diamonds shall be eligible to be an Associate Member. The Associate Member shall have a right to participate but shall have no right to vote at any General Meeting of the Association. Any person, firm or company who desires to be admitted as any ordinary member of the Society shall apply in writing to the Association signifying his or their intention to become an Ordinary Member of the society and inter alias stating the names of not more than 2 persons he or they intend to nominate as his or their representatives to attend and vote at the meetings of the Association. The Society shall thereupon forward to the said person, firm or company, as the case may be, a questionnaire to be filled in and forwarded to the Society duly signed together with the sum of Rs.1500/- as entrance fee and RS. 1000/- as the Annual member subscription fees. In case of any person, firm or company who desires to be admitted as Associate Member of the Society, such person, firm or company as the case may be shall apply in writing to the Society signifying his or their intention to become Associate Member and inter alias stating the name of not more than 2 persons he or they intend to nominate as his or their representative to attend at the meeting of the Society. The Society shall thereupon forward to the said person, firm or company, as the case may be, a questionnaire to be filled in and forwarded to the Society duly signed together with the sum of RS. 1000/- as entrance fee and RS. 750/- as the Annual Associate Members subscription fees. The application and the questionnaire shall be considered by the Executive Committee who shall have the absolute power and discretion to accept or reject the application without being bound to give any person. In case the application referredis rejected, the entrance fee and the annual subscription fees forwarded with the said application shall be refunded to the said person, firm or company as the case may be. All subsequent annual membership subscription shall be payable by all members on the first day of January each year. Upon payment of the entrance fee and other annual membership subscription, every member shall be entitled to get a copy of the Memorandum of Association and Rules and Regulations of the Society. Any extra copy will have to be paid for. The Executive Committee may refuse to supply more than one extra copy to a Member. No member shall be absolved from the operation of the Memorandum of Association and Rules and Regulations of the Society on the plea of not having received a copy thereof. (a) is adjudicated or adjudged an insolvent. (b) is convicted by court of the criminal offense involving moral turpitude. (c) becomes of unsound mind or physically unfit or unable to act as such. (d) resigns, retires or ceases to be a member of the Society. (e) In case a member is a Company or Corporation, a resolution (otherwise than voluntary for the purpose only of reconstruction) shall have been passed or an order made by a competent Court for winding up of such Company or Corporation. A Member whose subscription is in arrears after intimation in writing by the Secretary of the Society for payment thereof shall not be entitled to be present or vote at any meeting of the Society and any member whose subscription of any part thereof shall be three months overdue after the aforesaid notice by the Secretary may, by a resolution of the Executive Committee, be excluded from the membership of the Society and shall forthwith upon such resolution being passed cease to be a member of the Society and forfeit all his interest and privileges of membership, but the arrears shall remain a debt due to and recoverable by the Society.